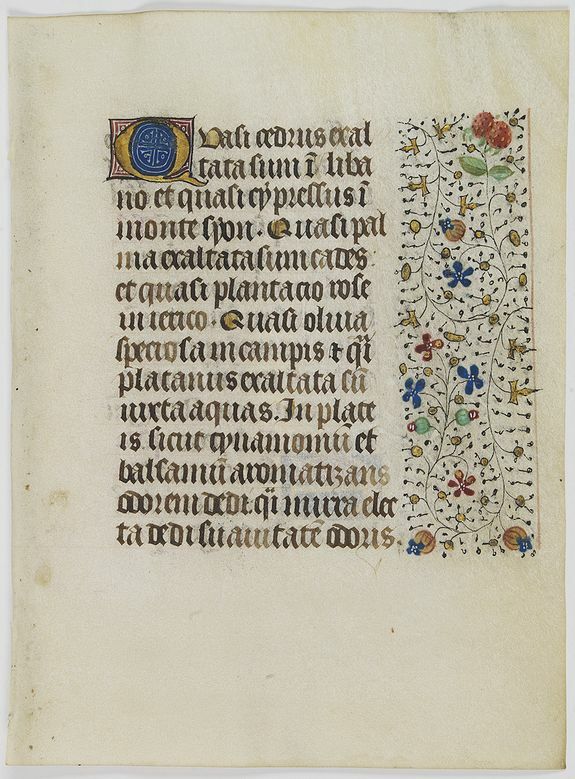 FRANCISCAN BOOK OF HOURS - Leaf on vellum from a manuscript Book of Hours, use of Rome. Title : Leaf on vellum from a manuscript Book of Hours, use of Rome..
Map maker : FRANCISCAN BOOK OF HOURS. Date : Paris, ca. 1470. Size : 6.3 x 4.7 inches. / 16.0 x 12.0 cm. Description :Wide panel border with designs of burnished gold ivy leaves and colored flowers on black hairline sprays. 14 lines of text in brown ink. Ruling in pink ink in fine gothic textura script, with rubrics in red. RECTO : With 1 two-lines initial in liquid gold in gold on red and blue ground with delicate white tracery. VERSO : With 1 two-line initial in liquid gold in gold on red and blue ground with delicate white tracery. Condition : Some marginal discolouration. Very good condition.